This is a Collection of Kitchen Utensils. Originally created with Blender 2.77. This collection is suitable for use in broadcast, high-res film close-ups, advertising, design visualization etc. 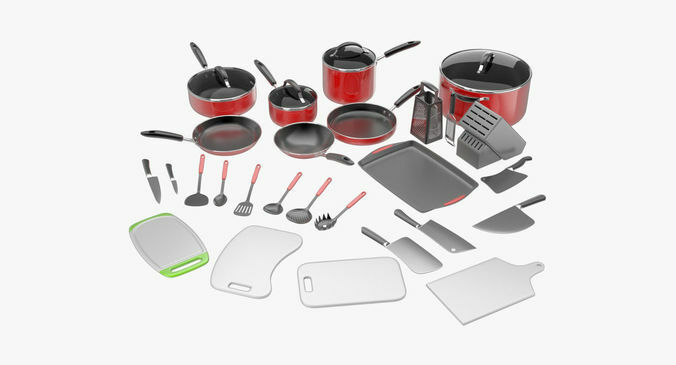 This collection contains 3 Pans, 4 Pots, 4 Cleavers, 6 Spatulas, 2 Graters, 2 Kitchen Knives, 4 Chopping Boards, 1 Tray and a Knife Block. This collection is intended for subdivision. This Collection contains -Subdivision level 0 - 43650 polygons. -Subdivision level 1 - 172226 polygons. -Subdivision level 2 - 688904 polygons. This collection contains Blender Cycles materials. All preview images are rendered with Blender Cycles Renderer. Uses subdivision level 2 model. Product is ready to render. Render setups are included as a separate Blender files, which is needed to produce images that match the thumbnails. Models are built to real-world scale(the unit system is metric). No third-party renderer or plug-ins needed.